We are the leading reservations specialist in the securing of aerial-assisted utility construction, maintenance and repair solutions for Alaska transmission line construction and installation. 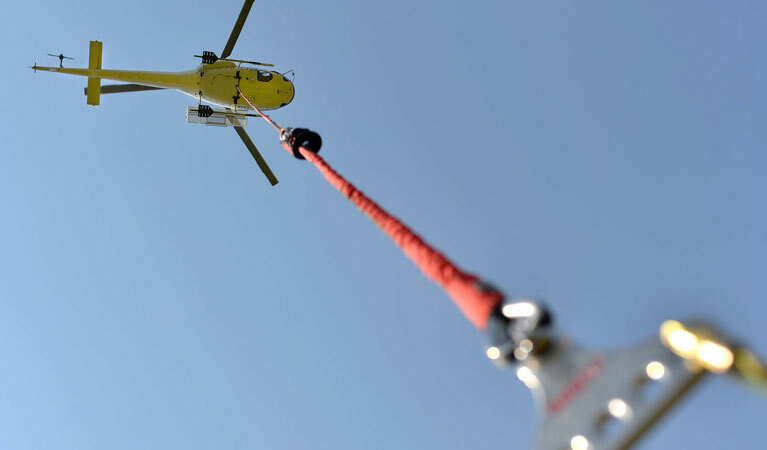 Via access to an extensive network of nationally and globally located operators, FairLifts reserves expert helicopter services for utility companies and contractors in their efforts to expand connectivity across cities, states, and regions. A helicopter’s inherent capabilities make it an ideal resource when used effectively in utility installations and construction. Simply because they are speedy, maneuverable and can easily achieve access to areas in which rugged terrain and fragile ecosystems can make foot and terrestrial vehicle traffic an impossibility. Not only that but helicopters can additionally transport heavy material loads externally and carry a number of workers to sites, even if they are remote or offshore. This is especially beneficial in environments where the terrain is widely diversified as are the peaks, valleys, waterways, and glaciers in Alaska. The state of Alaska is blessed with an overabundance of indigenous energy resources. Unfortunately, the region’s unique topography and massive size, which, although majestic and stunning, possess a hugely undeserved infrastructure make it nearly impossible to transport or transmit these valuable resources to the state’s population. In areas where miles of transmission lines need to be established and yet are vastly impassable due to a lack in road ways, as was the case in the construction of 57 miles of transmissions lines through the Tongass National Forest several years ago, helicopter-assisted aerial support is the only viable option. Alaska’s topography is largely dominated by large waterways, mountainous terrain, glaciers, and islands, therefore the need for aerial support is even more integral in establishing and maintaining connectivity. FairLift’s representatives are available night or day to reserve a number of helicopter facilitated services for Alaska transmission tower construction projects. FairLifts delivers access to an extensive network of experienced and professional utility installation facilitators, ensuring you receive a quality experience every time. When utility companies or contractors seek out our expertise, we take pride in sourcing professional operators, aircraft and hardware to get their projects completed in a way that exceeds their expectations. Read on to see all of the ways FairLifts serves to enhance the construction of transmission towers and the establishment of lines in Alaska. Heavy lift helicopters are used to transport equipment, gear, workmen, and materials to installation sites. Materials like tubular steel, concrete, and wood are transported via cables affixed to the bottom of heavy lift capable helicopters that can safely transport and effectively fly while carrying extremely weighty loads. Additionally, longines and skid level platforms are suspended beneath helicopters so that experienced linemen can perform inspections, install and/or make repairs to wires, conductors, cross-arms, and more. Applying the use of helicopter facilitated aerial support in the stringing of wire onto transmission towers across Alaska makes the process smoother, more time and cost effective and simpler. Wires can be strung in a fraction of the time it takes ground crews to travel to the installation sites, climb the poles or elevate themselves with bucket trucks. Plus, helicopters can achieve access to remote or impassable locations terrestrial vehicles cannot. 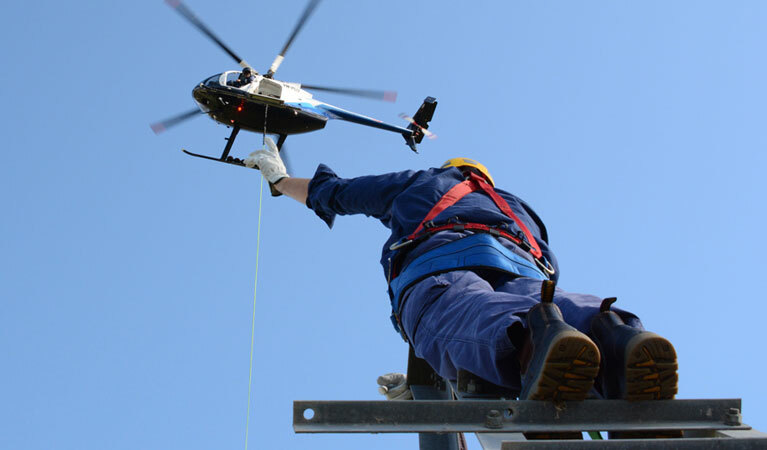 Helicopters may be utilized throughout the process of pole installations especially with regard to driving new poles and in upgrades to outdated existing poles. Not only can helicopters help to set the poles, they can additionally transport all of the material and gear needed to the site and remove leftover debris following construction. 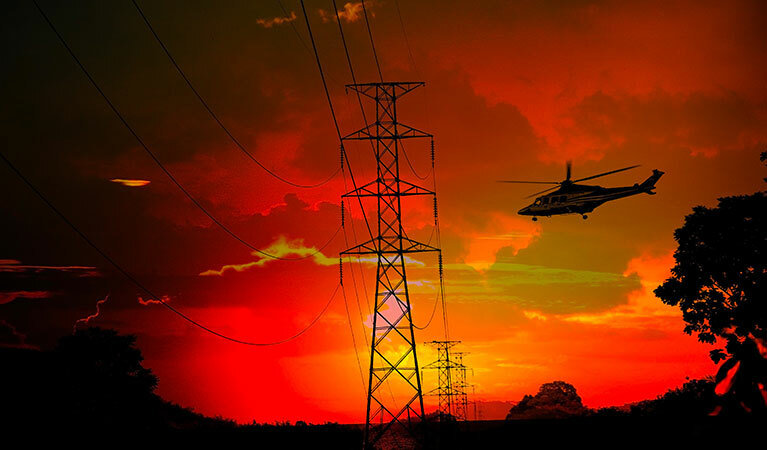 Aerial inspections performed in helicopters deliver a more widespread view of power grids and installation locations. Inspectors can look for debris around ROWs and inspect power lines and towers for inconsistencies following construction faster now than ever before. Safe, secure and expedient transport of work crews to offshore locations, remote destinations or up to high elevation installations in efforts to construct, inspect, repair and maintain transmission towers and lines with FairLifts reserved helicopters. Secure aerial support for the construction of transmission towers in Alaska and beyond! FairLift’s agents are available 24/7 to answer questions, talk project specifics, elaborate on helicopter services and reserve aerial support for Alaska transmission tower construction. Clients can complete the convenient contact form or reach out to us by phone anytime, even to receive a complimentary price quote.